Many sources of food for bees grow in untended patches of ground at the edges of roads, along fences, and in vacant spaces. These places are under pressure from development and the bees’ food sources are destroyed in the process. Some very important food sources are also targeted as nuisance weeds, such as Himalayan blackberry and Japanese knotweed. The systematic removal of these food sources puts a strain on the bees and other pollinators that depend on them. 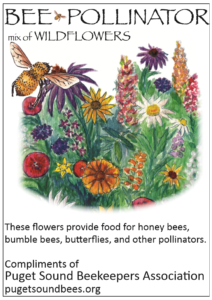 Our PSBA seed packets will grow flowers that feed honey bees, bumble bees, butterflies and other pollinators. 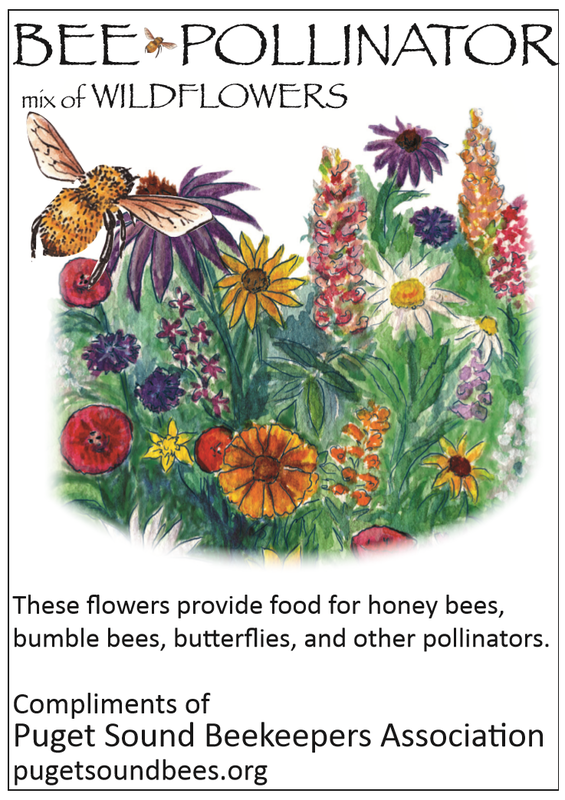 Look to see how many different kinds of pollinators come to your garden! After you plant your seeds, tell us where! We’ll add your patch of flowers to our map to show our progress in adding more forage for bees! An easy to grow colorful mixture of approximately 18 species of annuals, biennials, perennials averaging 3 feet in height. The importance of pollinator insects in nature, agriculture and the home garden has become increasingly recognized. Recently, bee populations in particular, have been negatively impacted. A combination of factors, including habitat destruction, chemicals in the environment and pests preying on bees all seem to play their part. Healthy bee colonies need to feed on a steady supply of flower pollen throughout the growing season. PSBA will have a supply of seed packets available for FREE at any event we host or attend – checkout our events calendar for dates and times. In addition, if you would like to order seed packets in bulk (say, for a classroom or group planting effort) please order from our store and we will be in touch to arrange for pickup/delivery. Select a sunny location and plant in well drained soil during early spring or fall, in mild winter areas. For best results, loosen soil with rake or hoe. Mix seeds with a cup of sand or other inert material and broadcast each gram of seed over 300-500 sq. ft., Lightly rake seed into soil or cover with peat moss or similar light mulch. Keep soil moist until plants begin to grow. Care: Requires little care. Water only when necessary. Did you plant some seeds? Tell us where by filling out the form below and we’ll map it!